I wrote about all the lovely Greek yogurt Total sent me the other day after a Twitter exchange with them (click here). 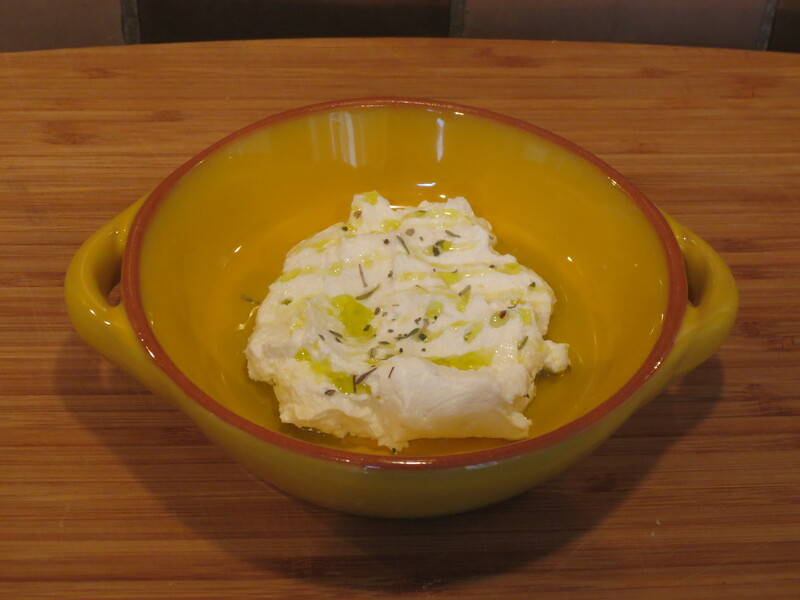 I decided one great thing to do with some of it was to make some labneh. 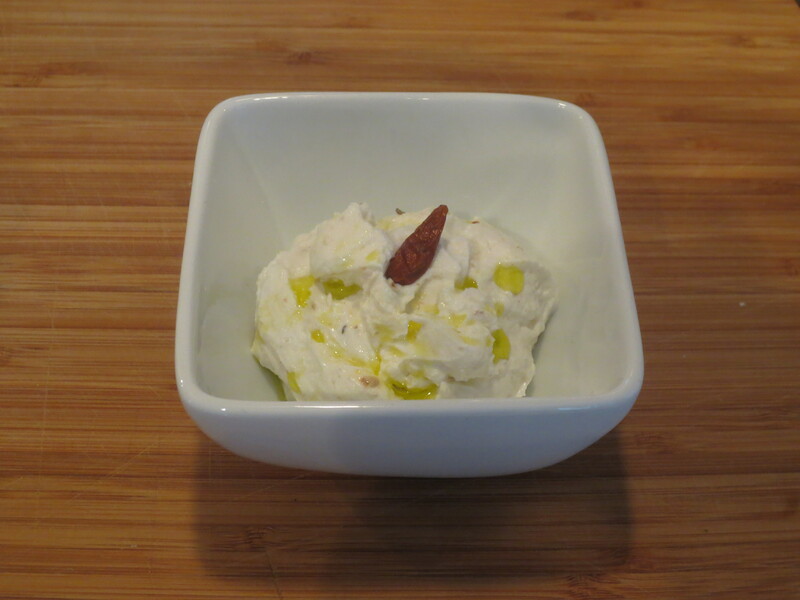 Labneh is an East Mediterranean/Middle Eastern soft cheese made from strained yogurt. 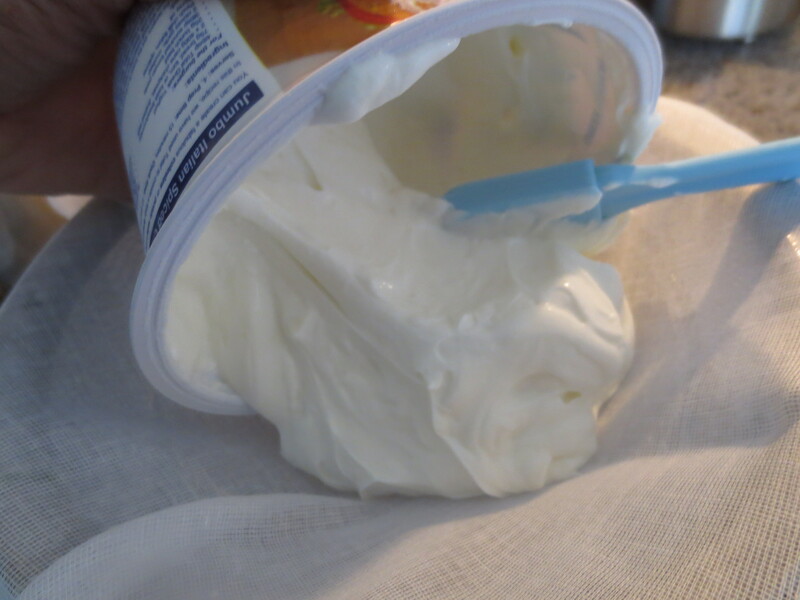 You could make it with any yogurt, but I think a good Greek yogurt is likely to be best. I’ve never made cheese before but I think this must be just the simplest ‘starter’ recipe for the novice. I found instructions in Sam & Sam Clark’s Casa Moro and followed their guidelines for proportion of yogurt to salt. And really, that’s all it is: yogurt and salt. 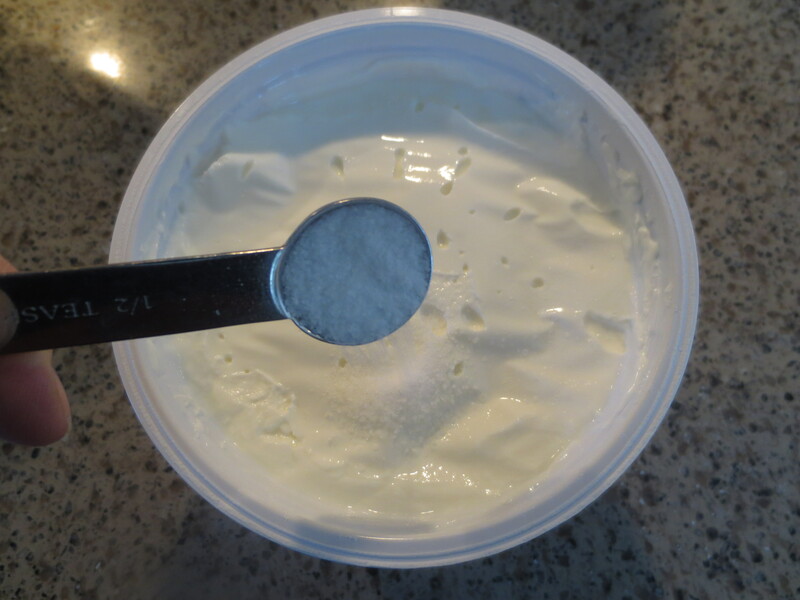 Surprisingly, not a lot of salt – only 1/2 teaspoon to 500g Greek yogurt. I wanted to flavour it in three ways, but first I had to get going 24 hours ahead of time. Searching the internet, I found recipes where the straining time for the labneh varied between 4 and 48 hours. Since I planned to roll some of it into small balls to marinate, I thought more time rather than less, for it to get thicker and more solid, would be a good idea, so I left it for 24 hours. 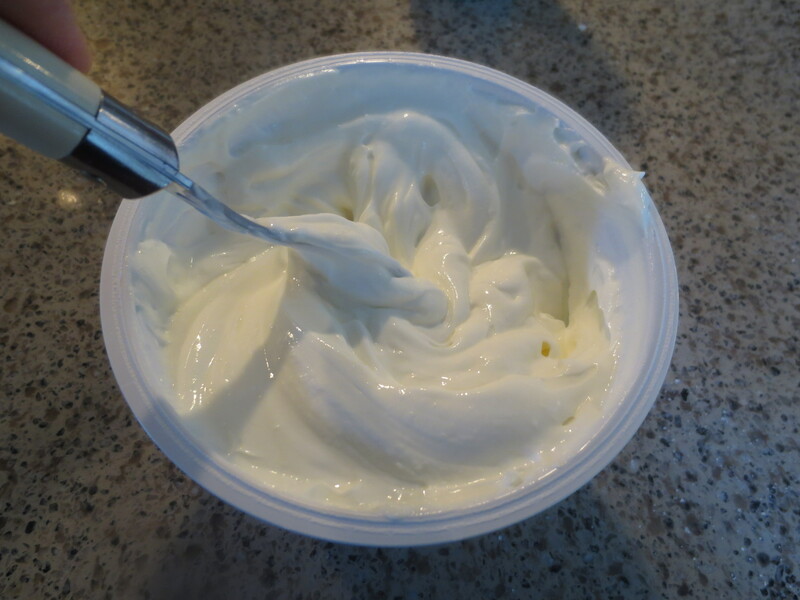 The first thing to do is take a 500g pot of Total Greek yogurt (do NOT be tempted to use ‘Greek-style yogurt’ found in supermarkets – that won’t do; you need the real thing and preferably full-fat for flavour). Add 1/2 teaspoon of fine sea salt straight into the pot and give it a good stir. 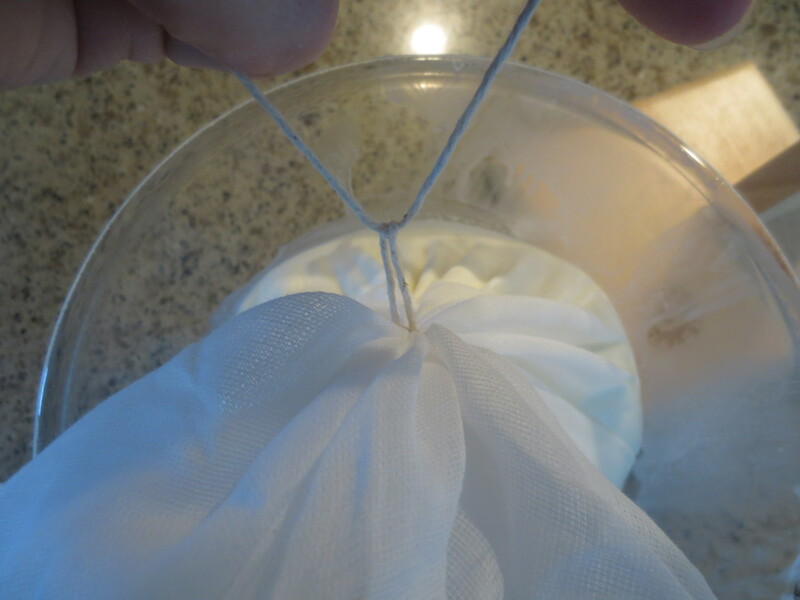 Now transfer the salted yogurt into the middle of a large square of fine cooking muslin. Pull it up towards the middle and tie with a piece of string. Put a second knot in to make a little loop. Now hang it from something like a banana tree, as I did, or if you don’t have anything suitable, just leave it in a strainer over a bowl. Now put it in the fridge for 24 hours. Remember, this is a guideline only, but it is best to leave it for a few hours – certainly at least 4. What I found interesting watching it – well, seeing it every time I opened my fridge – was that in the initial stages the whey from the yogurt drained out very quickly, but after a few hours not much more happened. So maybe 24 hours rather than 4-6 doesn’t make a lot of difference, but I patiently waited until this morning to carry on! When I took it from the fridge this morning there was a lot of whey underneath the muslin ball of cheese. And when I carefully lifted it off the stand and opened up the edible package I have to say I was quite impressed. It did look good! I couldn’t resist an immediate little taste and found it was delicious: rich and creamy and very tasty. But I had some plans for it, rather than just eating it ‘straight’. I divided it into three. I thought I’d like one version fairly plain so I could appreciate the ‘pure’ flavour and so I simply put it in a bowl, drizzled over a small amount of extra virgin olive oil and sprinkled just a pinch of Herbes de Provence on top. The next third, I decided to flavour with cumin and chilli. I pan-roasted about a teaspoon of cumin seeds to bring out the flavour and then ground them in a mortar and pestle with a pinch of chilli flakes. The resulting roughly ground mix made about a level teaspoon and I mixed that into the labneh, put it in a bowl, drizzled over a little oil and left it for the flavours to permeate a bit. You could serve it straight away, but I thought an hour or so in the fridge first was a good idea. The final third I wanted to marinate. First of all I rinsed a small clean glass jar with boiling water to sterilise it and left it to cool. Then I used a teaspoon to take a spoonful of labneh and rolled it into a small ball with oiled hands. I thought because the cheese was soft it would be difficult, but with oiled hands it was really easy to shape them well. I then rolled the little balls in some dried oregano. I got 7 balls. I didn’t weigh them, just guessed, so you can make as many as suits you of about that amount. I then carefully transferred them to the clean jar before slowly pouring over some extra virgin olive oil. I put the lid on and then put the jar in the fridge. I think I need to leave them to marinate for at least a day before trying this version. Of course, you could add other things like dried chillis or a garlic clove but I thought I’d begin fairly simply for this first excursion into cheese making. 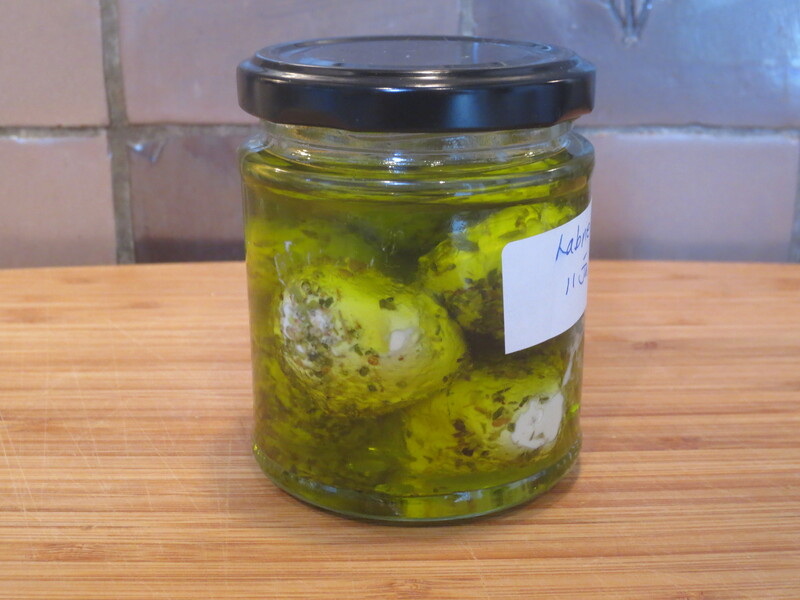 The labneh was great fun to make. I liked watching the whey drain and seeing the process of making the cheese. 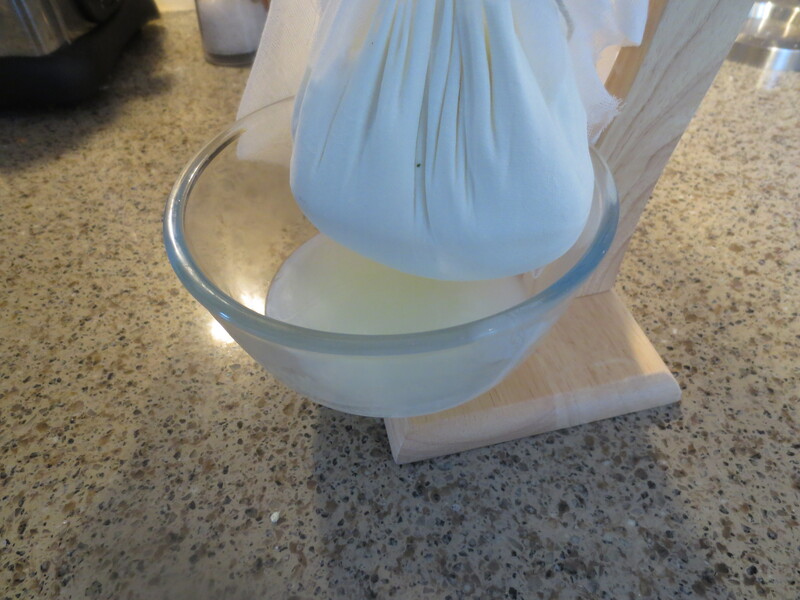 It was incredibly easy, of course, but even so it felt good to have made this cheese myself. 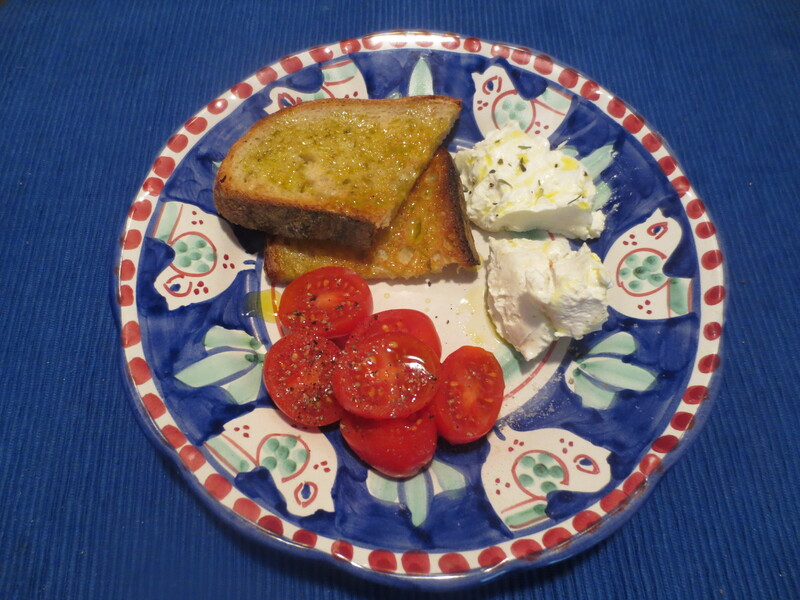 I ate it for lunch with some toasted sourdough bread and a few tomatoes, trying out both the plain and spicy version. (I’m leaving the marinaded version for a day or two.) Traditionally the labneh is eaten with flat bread but really you can use it in any way you’d use cream cheese: on fresh bread, toast or crackers. It’s a softer, sweeter flavour than a goat’s cheese but has a nice, slight hint of tartness compared to a ‘standard’ cream cheese because of the yogurt base. 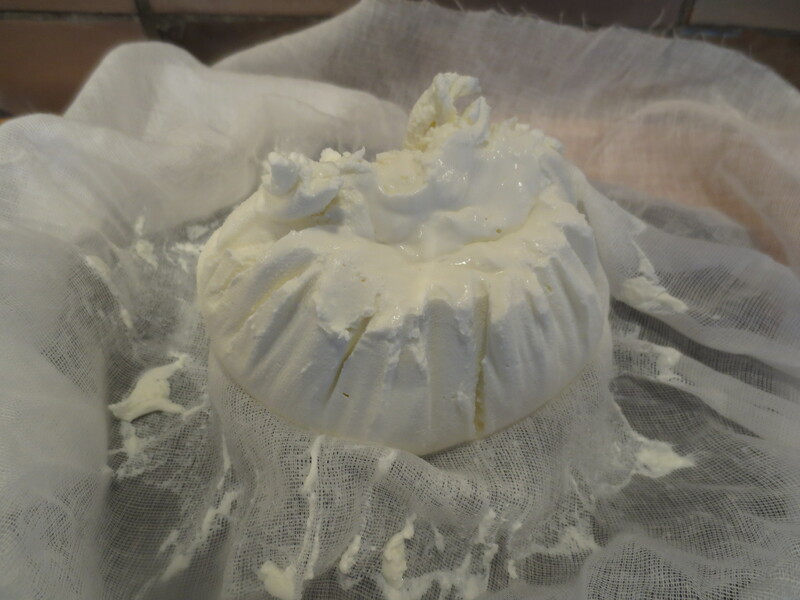 It’s soft and creamy, whereas some bought cream cheeses can be quite dry. And, of course, you know it’s free of additives and preservatives – other than what you choose to put in. 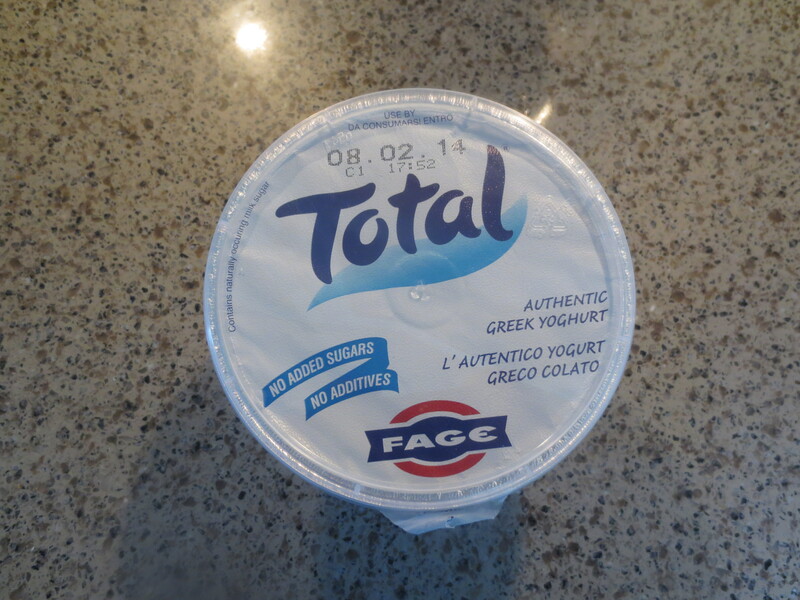 Total yogurt is very pure – no additives at all – whereas if you read the label of ‘Greek style’ yogurts you’ll see there are often quite a few additives, including starch to thicken them. That’s why I like to use the Real Thing! It was fun making this and the result really good so I’m sure I’ll be making more and trying out some different seasonings and ways of using the labneh. Fabulous! I love that you made it three different ways! I’ve made farmers cheese, but not gone the whole way with the yogurt. I’d love to try this myself! Thanks! Thanks Mimi. It was fun to make and really delicious. Don’t know why, but Labneh always has me thinking dear Peter Gordon, the Prince of Fusion. Vong may be Alsace/USA King, but Peter had better ideas – discuss! 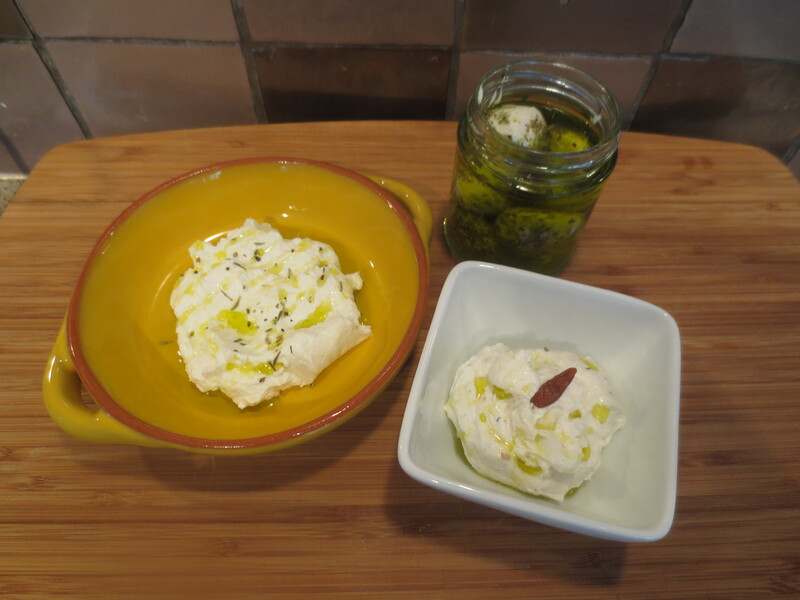 Love Labneh – so thank you. Like aged Ricotta it’s good sprinkled with coarse cane sugar and mashed with a fork by each diner. Promise. Thank you, Gareth. And I’ll definitely try it with the coarse cane sugar as you suggest. This took me back to my childhood. Something I had completely forgotten. 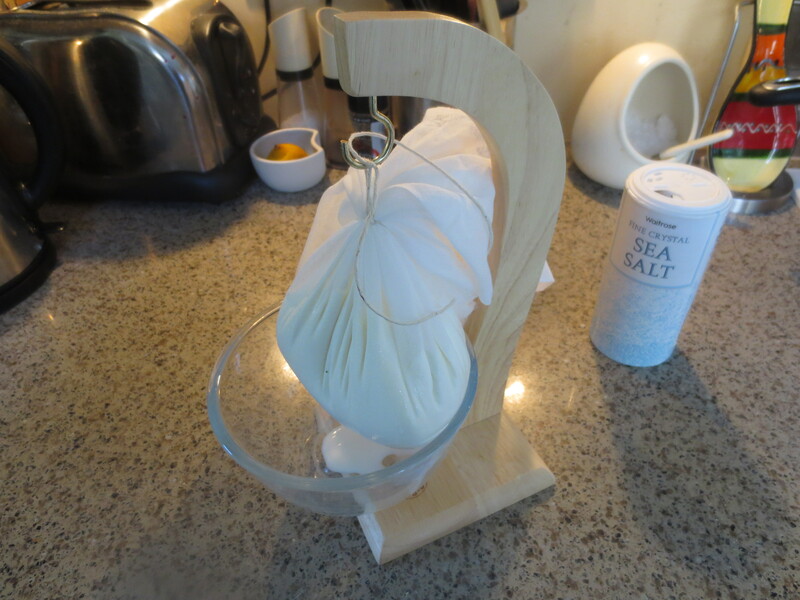 My mother used to make cheese and I can see it now in its little muslin bag, hanging over the kitchen tap. I suppose she must have used sour milk. I was born in Glasgow in 1943 so this must have been just after the War. And I do remember eating it, its creaminess, and having it with a little jam. So I’ll just have to make Labneh! It looks absolutely delicious. And it’s such a reminder in our ‘click and collect’ world of the excitement of making something by hand.